The Colorado Avalanche may be a team that is resurgent, but they are not the best nor are they a complete team. The Avs defeated the defending champs back in November, blowing out the Chicago Blackhawks 5-1 at the Pepsi Center. The Hawks returned the favor in spades Friday night, bloodying the Avs 2-7 behind a Patrick Sharp hat trick, on his birthday no less. There wasn’t anything that could be done Friday as the Hawks looked Sharp’s way and he delivered everytime. The Avs have had this happen to them before, but the Hawks just thoroughly manhandled the Avs and it just further exposed an underlying problem that will separate the men from the boys come April. The Avs were (once again) outshot – 18 to the Hawks 37. It is becoming embarrassing to watch the Avs either turnover the puck while on offense or see them work it around the zone, burn up the clock and still come away empty handed. The offense needs to be more aggressive or become more efficient, or both. That still does not excuse JS Giguere for giving up seven points before the end of the 2nd period. He was victimized by Sharp and Jonathan Toews (2 goals), being subbed out during the second intermission for Semyon Varlamov who luckily did not give up a goal in the third period. 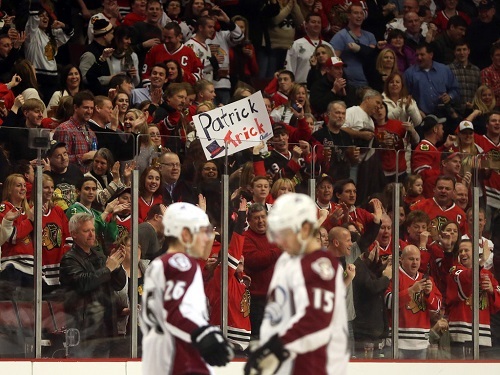 Blackhawks fans celebrate Patrick Sharp’s hat trick against the Avalanche in the second period. Watching the Avs play the defending champs -and number one team in the league- is just a further glimpse of the road that Coach Patrick Roy and his team still have yet to travel. Chicago is a complete team and worthy of their title while the Avs are still finding their legs as a more dominant team than before. The problem the Avs now must face is how to overcome their offensive struggles and return fire in-kind. The Avs are in the middle of the league with shots per game at 29, but rank in the lower half of the league in shots given up with 31. The Blackhawks on the other hand rank number two in shots taken and third lowest in shots given up (33 and 26). Colorado has to prove they can hang with the champs because they are a likely opponent if the Avs reach the playoffs as a lower seed. It could be a very fun series of lopsided losses and wins, but it would ultimately be a quick exit at this stage in the season. Colorado is improved, but Chicago is the dominant force in the Western Conference.